At Memorial Prayer Cards Funeral Homes are our primary customers. We deal with dozens of funeral homes each and every day. We understand the need for immediate response to an order. Once you place an order we go right to work preparing a design proof for your approval. All orders ship within 24 hours of approval Monday through Friday. We provide the tools to help you serve your clients. Why choose Memorial Prayer Cards for your Funeral Home? • 24 Hour Turn-A-Round. Place an order today have it ship tomorrow. • Free Professional Photo Re-touching with all orders. We make every photo looks it absolute best. • The largest and finest collection of prayer card images available. We have 1500 images in our card choices and over 3 million images in our library. • Easy ordering and timely responses. You will have a design proof in your e-mail with-in minutes of placing your order. • Best Prayer Cards available anywhere because we start each job with a blank piece of heavy card stock, after it is printed and laminated our cards are die cut to give them a clean, professional, contemporary look with no old fashioned clear borders. One look and you will see why our cards are the best. • Customer Service Beyond Extraordinary. We work hard to make each order an easy and stress free experience. Our 92 page Online Catalog is available for you to send to clients as a website link. In the privacy of their own homes they can select the prayer card they wish. It has no mention of our company name or company website anywhere. 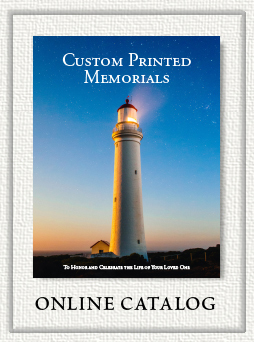 Our 92 page Custom Printed Memorials Print Catalog is available to Funeral Homes only. The catalog has no mention of our company name or website anywhere on it. Discount Funeral Home Price list is available upon request. 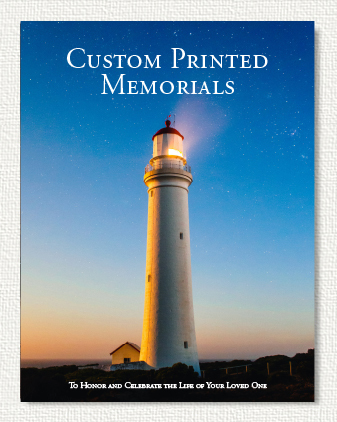 Free samples of Memorial Prayer Cards, Memorial Bookmarks, and Memorial Thank you notes are also available upon request. The Memorial Prayer Cards you order can have your Funeral Home name and location(s) printed at the bottom or if your prefer left blank. 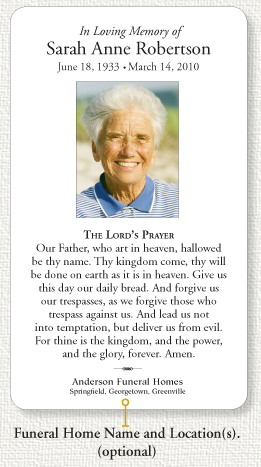 Memorial Prayer Cards ©2012 • Memorial Prayer Cards on the internet since 1998.